Jersey winger Ed Dawson scored a hat-trick in the space of 10 first-half minutes as the Reds beat Guernsey 48-3 to retain the Siam Cup. Jersey went ahead through Ryan Hodson's try before Dawson's sparkling spell put the hosts in control. Glen Walters' penalty got Guernsey on the board, but a penalty-try and scores from Fautua Otto, Drew Locke and Nick Campbell secured a comprehensive win. The result extends Jersey's Siam Cup winning run to seven years. Underdogs Guernsey had started the game brightly but Hodson's try from a maul, on his final outing for the club, set Championship side Jersey on their way. Jersey-born Superman actor Henry Cavill was watching on at St Peter, but Dawson was Jersey's hero on the pitch with his burst of three scores in a stunning 10 minutes midway through the first period. His first came when he latched onto an accurate cross-field kick from fly-half Aaron Penberthy, added to by an interception try soon after and then a third in the corner. 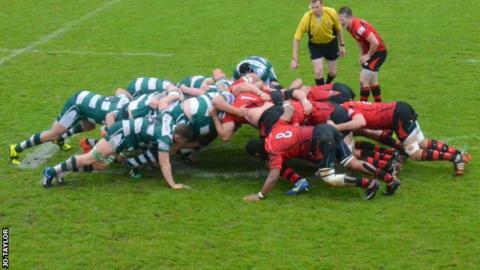 Guernsey pressurised the try-line just before half-time but could not find a way over the whitewash. They eventually registered their first points 10 minutes after the break with Walters' straight-forward penalty. Jersey hit back when referee Rob Warburton awarded a penalty-try as the scrum moved towards the line, and then Samoan winger Otto sprinted through to touch down after good work from replacement Drew Locke. Locke, making his last appearance for the club before switching to London Scottish, went over for a try of his own soon after, with second-row Nick Campbell easing in unchallenged for the eighth try right at the death. Jersey also won the second-team match between the sides 48-0, and the veterans game 12-10, while Guernsey retained the women's Siam Cup with a 17-7 victory. Jersey: Jack Burroughs, Fautua Otto, Tobias Hoskins, David Bishop, Ed Dawson, Aaron Penberthy, Joel Dudley; Ignacio Lancuba, Nick Selway, Jon Brennan, Nick Campbell, Dave Markham, Alex Rae, Ryan Hodson, Paula Kaho. Replacements: Sam Lockwood, Martin Garcia-Veiga, Harry Williams, Nick Trower, Sami Fisilau, Jonny Bentley, Drew Locke, Ross Allan. Guernsey: Cameron Craine, Tom Ceillam, Layton Batiste, Lewis Hillier, Nick Merrien, Greg Smith, Matt Thomas; Nick Barton, Malcolm Barnes, Glen Walters, Dave Davison, Blair Campbell, Ned Brown, Matt Hema, Luke Sayer. Replacements: Simon Sharrott, Daniel Mann, Robin Le Cocq, Simi Sawene, Dale Martin, Anthony Armstrong, Andy Bailey.